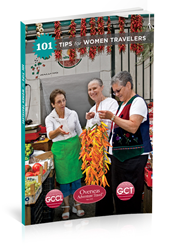 Grand Circle Offers Complimentary "101 Tips for Women Travelers" Booklet Now Available as E-Book, Flip Book, or Soft Cover. So many women are curious about other cultures and countries--and passionate about travel. Harriet Lewis, veteran traveler and vice chair of Grand Circle Corporation, the leader in travel, adventure and discovery for Americans over 50, is offering the newest version of “101 Tips for Women Travelers” to any and all interested women for free. More than 50,000 women have requested the booklet since its first printing in 2009. The latest version is available in print, as a Flipbook or as an E-book that can be downloaded to one’s IPad, Kindle, or favorite tablet by requesting it at http://www.oattravel.com/101tipsforwomen. “101 Tips for Women Travelers” is a compilation of tried and true tips culled from thousands received from Grand Circle’s female travelers, employees, and guides worldwide. It includes 10 chapters of tips on trip preparation, packing, health & hygiene, safety, going solo, communications, digital photography and video, and more. An appendix section includes information about digital resources, a packing list, clothing size chart, international time zone chart, foreign phrase list, book and film recommendations, and even Bandanarama, which offers 25 uses for a scarf. Interspersed throughout the booklet are inspirational quotes and stories of intrepid women travelers, some well-known and some not, throughout history. To view a Flipbook online, download an E-book, or request a soft cover version, please visit http://www.oattravel.com/101tipsforwomen. Soft cover versions will be mailed within 7-10 business days. Grand Circle Corporation is the leader in international travel, adventure and discovery for Americans over 50. Through its three travel entities: Overseas Adventure Travel (est. 1978), Grand Circle Cruise Line (est. 1998) and Grand Circle Travel (est. 1958), the organization offers more than 100 small group adventures, river and small ship cruises and cruise tours, and escorted vacations to more than 85 countries. Grand Circle serves more than 110,000 travelers each year and has more than 30 offices worldwide. In 1992, owners Alan and Harriet Lewis established the nonprofit Grand Circle Foundation to support communities in which Grand Circle works and travels, including some 300 humanitarian, cultural, and educational endeavors worldwide—among them, 100 schools, in 50 countries. The Foundation is an entity of the Lewis Family Foundation, which has pledged or donated more than $164 million since 1981.